Wendell Smallwood, Corey Clement and Matt Jones during OTAs at the NovaCare Complex. Eagles fans will get a lot of fourth string running back action Thursday night. That's because Jay Ajayi, Corey Clement and Darren Sproles — the three locks to make the 53-man roster at the running back spot — will be resting against the Browns. 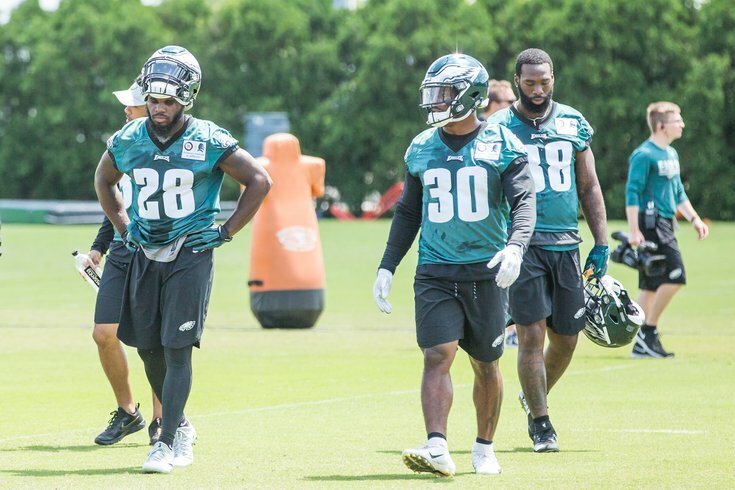 Which leaves returning Eagle Wendell Smallwood, undrafted rookie Josh Adams and veteran Matt Jones to compete for what will likely be the final RB spot on the team this fall. "It's one of those sort of battles that we've been keeping our eye on this training camp and it's great," Eagles head coach Doug Pederson said." It's kind of ironic that it would come down to maybe a game or two." "This group is crazy," Smallwood said Tuesday after practice. "It's a huge group, there's no drop off. Everyone brings something to the table." Each player has his own advantage as the third preseason game approaches, Thursday night at 8 p.m. on FOX in Cleveland. Smallwood believes his familiarity with the Eagles' offense gives him a leg up. "I think it gives me a huge lead as far as knowing the system," he said, "what we do in this offense, it's kind of second nature to me now. It kind of helps me play faster. I will get to be me." Smallwood appeared to be an odd man out when training camp began, but a nagging injury to Donnel Pumphrey — one that will sideline him again this week — paired with a lackluster showing in New England for Jones and a lingering injury to Adams has opened the door for the Delaware native to remain with his hometown team. "[I was] not up to par," Jones said of his performance last Thursday, averaging just 3.2 yards per carry vs. the Patriots. "I feel like I could have played better. I played a lot of snaps on special teams and offense and fatigue took control and lack of focus. ... I did a good job this week running myself to death I worked hard with Nate Sudfeld to get ready for this week." Jones did add six catches for 32 yards last week and showed his big 6-foot-2, 239 pound body could be an asset with Philly. The final candidate, Adams, is a Notre Dame alum and Warrington, PA native and certainly a sentimental favorite to make the team. A minor injury to his foot in practice a few weeks ago kept him out of the second preseason game after playing in the first, but he figures to get a good share of reps in preseason Week 3. "After not doing OTA's I have to be smart with how I approach this and be wise," Adams said of missing valuable playing time last week. "As much as it is hard to sit out, you don't want to sit there and watch, it's about growing as an athlete and growing as an individual." Adams is the only running back without any NFL experience, at just 21-years-old, and is in prime position — at least from a learning perspective — to make a run at a surprise spot on the 53-man roster. "I am the youngest," he said, contextually comparing himself to the others in the running backs room. "Even if I wasn't, even if I was in the league and it was my first time being ion Philadelphia you are trying to learn all you can from the other guys and do the best you can to bring in a different style of play and up them. You try and pick up little things from those guys."